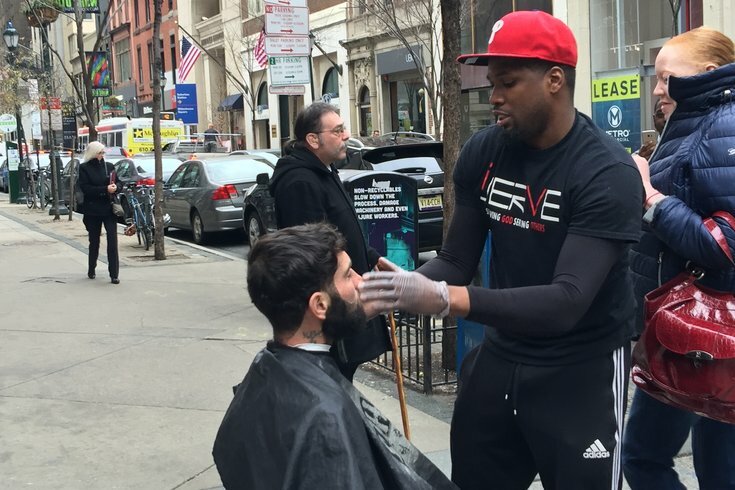 Brennon Jones, a barber who moved from Chester to West Philadelphia last year, said he will travel across Philadelphia and neighboring towns to give haircuts to as many homeless people as he can in 2017. It’s been nearly three months since we brought you the story of Brennon Jones, the local barber who had set out on a mission of kindness to cut hair for the homeless throughout Philadelphia and the surrounding region. Now, he’s taking his show on the road. On Tuesday morning, Jones shared the news that “Haircuts4Homeless is going on tour," explaining that he’s formed a team that will travel to other cities to spread the same sort of compassion that he initially brought to 15th and Walnut streets. Via a GoFundMe campaign, he’s seeking donations for a “Cutz of Compassion” Tour which will launch after a May 28 event in his hometown, which recently gave him the “Chester Makes Chester” citizenship award. When he sought volunteers for that Memorial Day Weekend event – it will include fellow barbers and stylists as well as personal trainers, a celebrity chef and nurses – the feedback came from beyond the Delaware Valley. It’s a costly endeavor, traveling with barbers and supplies, which led to the crowdfunding effort to supplement letters he’s sent local business owners asking for donations of money or items for the local effort and tour. In the meantime, he’ll still be out on the streets in and around Philadelphia cutting hair. On Monday, he was on Broad Street. He’s still deciding whether to hit Camden or Trenton on Wednesday.